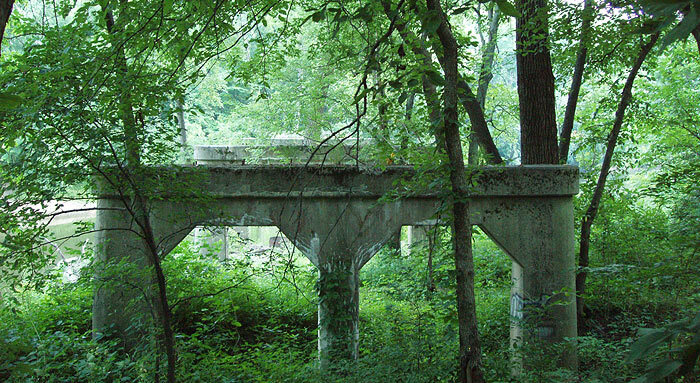 Like the columns of an forlorn and forgotten temple, the supports of an abandoned Route 66 bridge west of Lincoln, Illinois, rise from the bed of Salt Creek. Guided by John Weiss' book, Traveling The New, Historic Route 66 of Illinois , we decided to seek the "ghost bridge" while on a jaunt over Illinois Route 66 last year. This being the season for hauntings, I decided to publish it now. 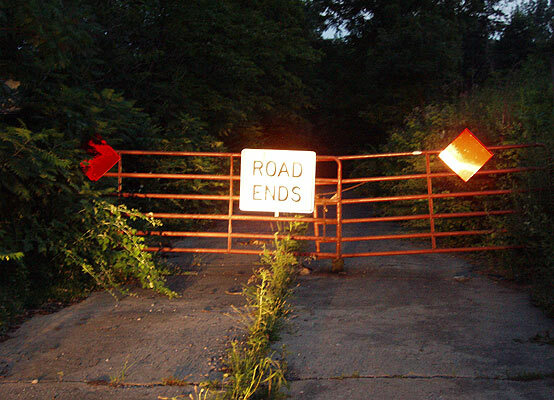 The bridge lies at the end of a few blocks of very much abandoned Route 66, which is blocked by this gate. 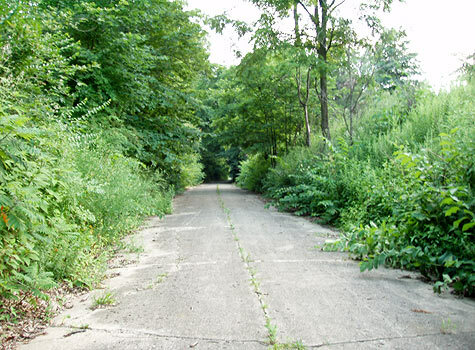 It's easy to walk around the gate, but watch for poison ivy. 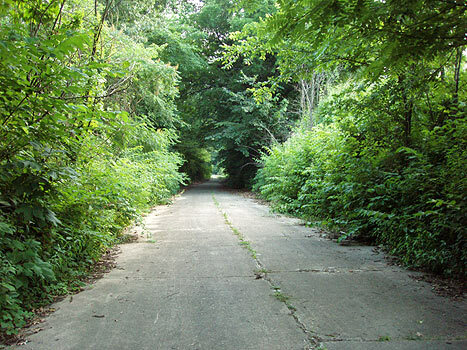 The area is known as Cemetery Hill, for the two cemeteries that lie flanking the entrance to the abandoned road. We arrived just before dusk, after a long day that had begun in Bloomington. At first, there was some sky visible. Rather shortly, the walk becomes almost claustrophobic as the woods that reclaim this crumbling tendril of Mother Road merge overhead to seal out the sky. The silence, stillness and growing dusk added to the feeling of a funeral procession to a dead bridge. Only occasionally, a hole opens in the overwhelmingly green tunnel and the fields beyond are visible. It took us about seven minutes to walk to the bridge. In the foreground, you can see where the pavement of the old road abruptly drops off. A distracted person running the road might find himself briefly airborne. It was almost dark by this time, and the exposures were rather long. You can see a little sliver of Salt Creek, to the left. If I read my sources correctly, this stretch of Route 66 would have been in use from 1926-1940. 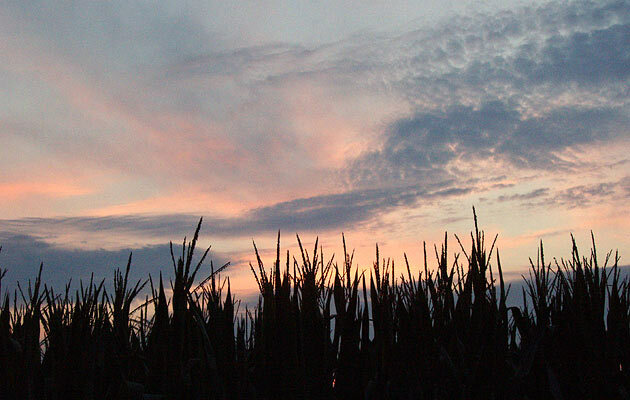 On the way back to the car, I stopped to admire a field of corn against the sunset sky. 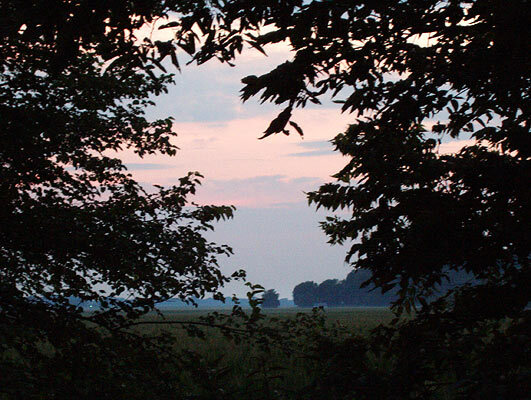 It was early July of 2006, and the crop was looking good. I wish I could say the same for the roadbed. Finally, I could see the light at the end of the tunnel, as it were. 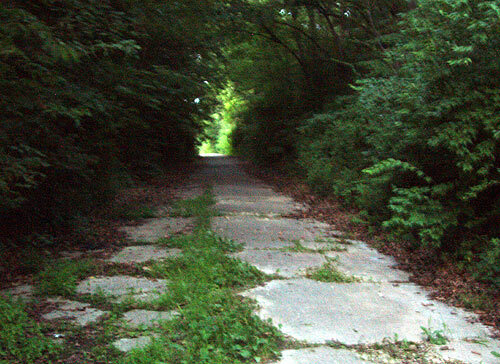 By the time I exited the abandoned road, it was dark enough that I had to use flash. Now, we had time to check out the two cemeteries that line the road. 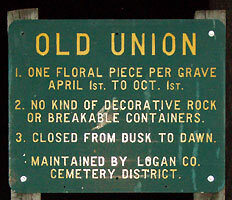 Old Union Cemetery is on the west side. This should not be confused with New Union Cemetery, which is closer to Lincoln. 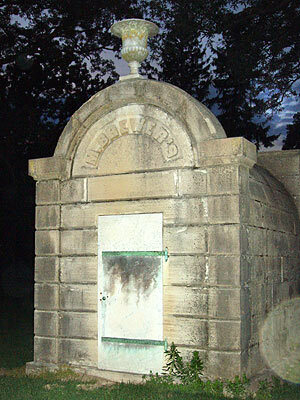 The website, prairieghosts.com, lists an Old Union Cemetery in central Illinois between Bloomington and Springfield, which it says is haunted by luminous spheres of light, not unlike Missouri's spooklight. It also mentions a sense of dread hanging over the place. What it doesn't mention, is the location of the cemetery by city or county, so I don't know if it's the same one. 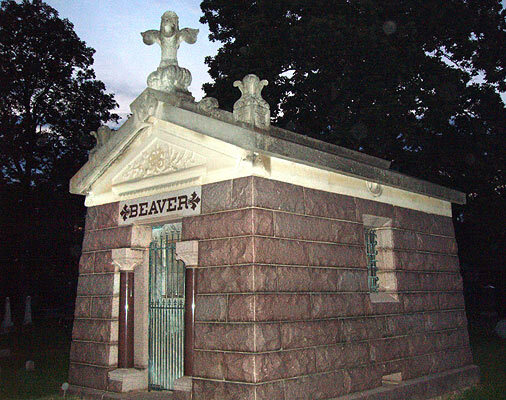 We noticed no obvious weeping angels or similar statuary, but the Beaver mausoleum had some nice roof decorations. This structure was labelled "M. Brewer's." 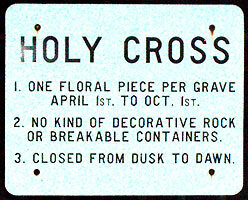 Literally, just across the road to the east is Holy Cross Cemetery. 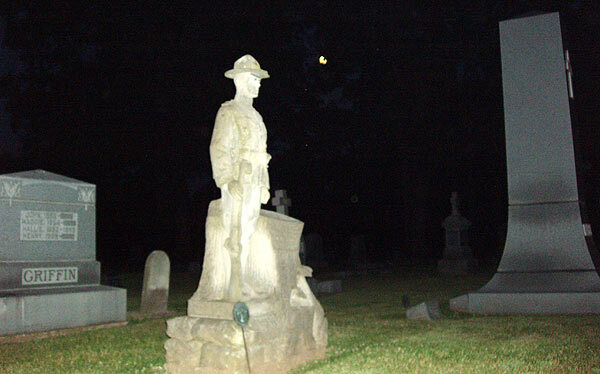 The soldier on this monument, marked "Griffin", was an ominous silhouette in the dark until I saw it in the flash. 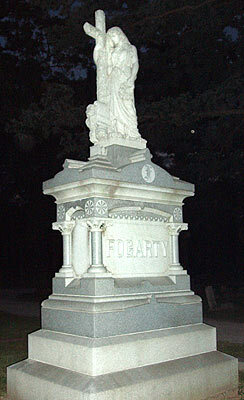 This rather tall monument belongs to "Fogarty." We continued on that night until lodging in Springfield, Il. Handy maps and more information about Cemetery Hill and Route 66 may be found at Mr. Lincoln, Route 66 and other Highlights of Lincoln, Illinois. 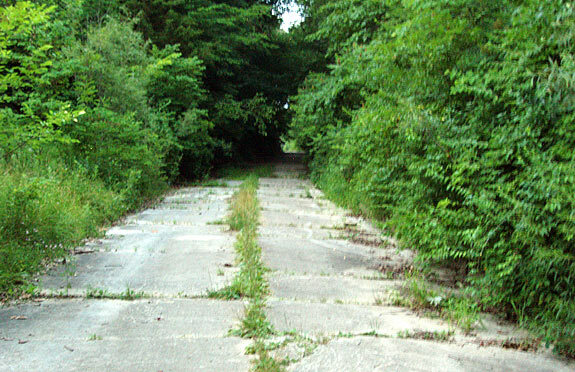 A practical road map may be found at Stefan Joppich's Route 66 Web & Atlas page for Lincoln, IL. Look for folie 17 on his Illinois page. Just looking at Ace's blog again and found this entry re: Route 66 in Logan County. I was born in Lincoln, IL and am familiar with the area. 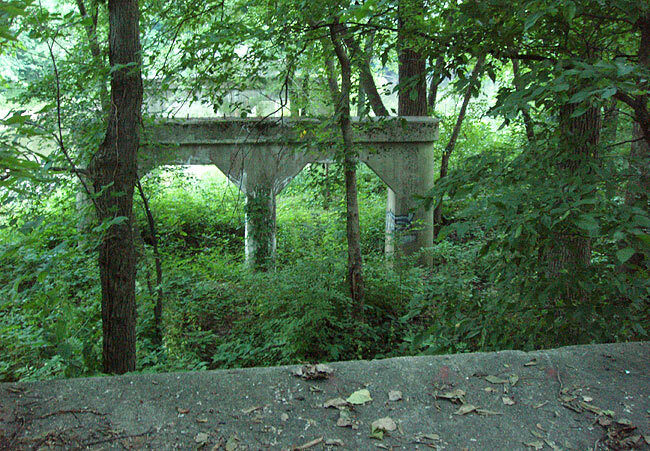 Where is the ghost bridge in relation to the city of Lincoln? And please tell me that you stopped to eat at the Dixie Truck Stop while you were on that stretch of the Mother Road. I wish I could go back in time about 70 years and drive the entire route 66. 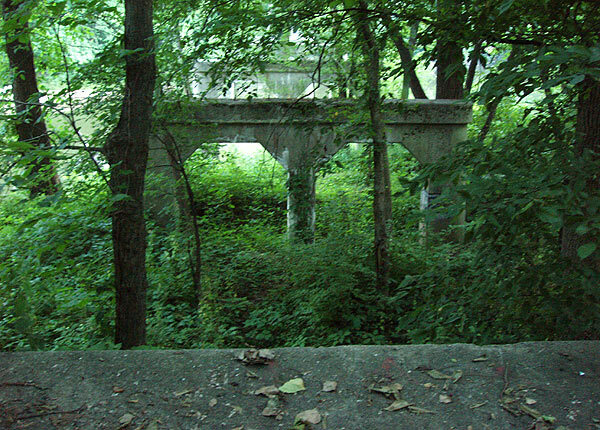 Andrea, the ghost bridge is SW of Lincoln, if not actually in the city limits. Find the cemeteries and you'll find the road to it. We did stop at the Dixie Truck stop, but did not eat there as we'd already done so at a few places that day (i.e. The Log Cabin Inn and Funk's Grove). We ate like hobbits on tha trip...breakfast, second breakfast, elevensies, brunch, lunch, etc. Jdp, about 85% of the route is still drivable. I think I'd prefer to drive it in about 1966, myself. 2007 ain't bad, though. You have some great pictures here. I was just out at the Old Union Cemetery today. I had never been through it before. 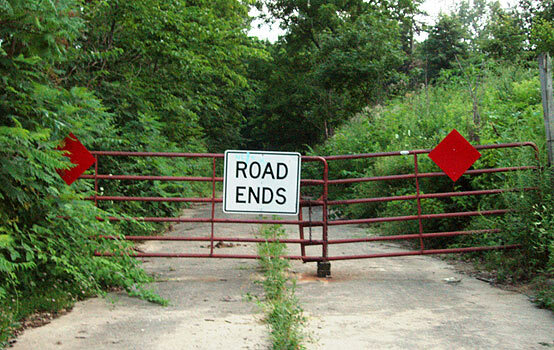 I thought about going down the closed road, wish I would have read about it before that, it would have been an interesting jaunt! I will go again in the next few days. I do want to say that New Union Cemetery is just across the road from Old Union Cemetery. Thanks for sharing your pictures and your experience!